One would never have thought the literary/lifestyle magazine Rogue, which published its first issue sometime last year, would find its way into any police or military list of “propaganda” (read: subversive) materials, but that was just what happened to a copy of it that was brought over by artists visiting the Tagaytay 5 last July 12. Not only that: those who brought it along with other reading and viewing materials for the detainees were harassed by police at the PNP’s Camp Vicente Lim, where the Tagaytay 5 are detained. One would never have thought the literary/lifestyle magazine Rogue, which published its first issue sometime last year, would find its way into any police or military list of “propaganda” (read: subversive) materials. But that was just what happened to a copy of it that was brought over by some members of the Artists’ Response to the Call for Social Change and Transformation (Artists’ ARREST) who went to the Philippine National Police’s (PNP) Camp Vicente Lim in Calamba City, Laguna on July 12 to visit the political prisoners collectively known as the Tagaytay 5. The Tagaytay 5 are Axel Pinpin, a consultant of the Kalipunan ng mga Magsasaka sa Kabite (Kamagsasaka-Ka or Association of Peasants in Cavite) and a poet who was a fellow in the 1999 University of the Philippines (UP) National Writers’ Workshop; Riel Custodio, a Kamagsasaka-Ka member; Aristides Sarmiento, a freelance researcher for various non-government organizations; and Tagaytay City residents Enrico Ybañez and Michael Masayes. They are facing rebellion charges filed in 2006 for allegedly conspiring with “dissident soldiers” in a supposed plot to destabilize the Arroyo administration. The five were abducted by a composite team of Philippine Navy and Philippine National Police (PNP) on April 28, 2006 in Tagaytay City. Pinpin, Custodio and Sarmiento had just come from a meeting with coffee farmers in the city and were on their way to Manila for the forthcoming Labor Day rally. They had hired Ybañez as their driver while Masayes accompanied Ybañez. Three days after, they were presented to the media as “communist rebels” who were conspiring with “dissident soldiers” in an alleged plot to “destabilize” the Arroyo administration. They were subsequently charged with rebellion. Following an investigation, the Commission on Human Rights (CHR) has recently ruled that their arrest and detention were unlawful. Their July 12 visitors – filmmakers Sunshine Matutina, Waise Azimi, Dahci Ma, Kiri Dalena, and Bong de Leon; Con Cabrera, a visual artist; Edge Genciagan, Vincent Silarde, and Afol Martin – had brought over the copy of Rogue together with other reading and viewing materials for them, fully expecting to be able to personally hand these over to the detainees. They were, however, refused entry. Several police personnel, led by SPO1 Gaudioso Reyes, told them that only the detainees’ lawyers and their immediate relatives – spouses, children, and siblings – were allowed to visit on weekends and holidays. This clearly contradicted the agreement that the Tagaytay 5 reached last December with the then newly-appointed Calabarzon (Cavite, Laguna, Batangas, Rizal, Quezon) PNP Director C/Supt. Ricardo Padilla. In a dialogue with Padilla last December, the Tagaytay 5 put forward a number of demands, among them that they be allowed to receive visitors other than their lawyers and immediate relatives even on weekends and holidays. “The logic behind that is that for most of our other relatives and our friends, it is more convenient to visit us on weekends and holidays than on weekdays,” Pinpin said. Padilla granted this demand, along with four others: beddings inside the cell, regular outdoor activities, allowing them to talk with their visitors inside the cell, and regular medical attention. 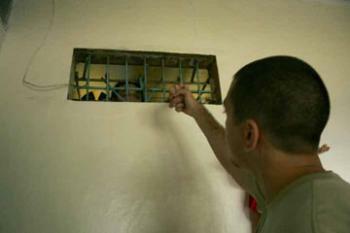 In fact, according to sources at the Camp Vicente Lim, Padilla even summoned S/Insp. Patricio Baludong Corcha, then the camp’s Base Police commanding officer, and gave him a dressing-down on weekend and holiday visits after the dialogue with the Tagaytay 5. 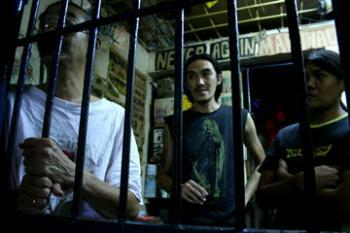 (The Tagaytay 5 are detained at Camp Vicente Lim’s Base Police Detention Center.) “Who told you that you can ban weekend and holiday visits?” Padilla reportedly asked Corcha. But this agreement between the Tagaytay 5 and Padilla on weekend and holiday visits is apparently lost on several of Camp Vicente Lim’s Base Police, as they have been frequently refusing entry to weekend and holiday visitors – who, on one occasion, even included Pinpin’s brother Berwyn. The July 12 visitors were just the latest to be refused entry. They tried to negotiate for almost two hours, after which they just decided to leave the reading and viewing materials they had brought for the Tagaytay 5. These consisted of the copy of Rogue; as well as a biography of Cuban cultural leader Haydee Santamaria, a book on the Cuban health system, and a comic book on the political prisoners collectively known as the Cuban Five; as well as DVDs of the recent Gawad Eden Marcellana; Rights, a series of public-service announcements on human rights violations, and several short Southern Tagalog Exposure documentaries. According to them, Reyes promised that these materials would reach the Tagaytay 5. They would, however, learn from friends who visited the Tagaytay 5 a few days later that the materials never reached their intended recipients. Two of them (whose names are being withheld upon their request, for security reasons) went back on July 16 to be able to talk to the Tagaytay 5, as well as to demand an explanation on the confiscation of the reading and viewing materials. As they were entering the detention center, they asked a policeman identified only by his surname Sangria whether the materials they had brought on July 12 had reached the detainees, to which Sangria replied in the affirmative. They were later informed by the Tagaytay 5 that as of that date, the materials still had not reached them. The two then went to the office of the current Base Police commanding officer, Insp. Alex Pornes, to ask for an explanation on the confiscation of the materials. Pornes advised them to go to R2 (Intelligence Division), which is headed by P/Supt. Primitivo Tabojara. This they did, only to find that Tabojara was not present. They were instead led into the office of another officer, who was later identified by R2 personnel only as Inspector Mendoza. As one of the visitors was asking him to elaborate, Mendoza started asking for their names. They agreed to give their names, on the condition that the officer (who had not yet been identified at that moment) would give his first. Mendoza said it was the two visitors who should give their names first since they were the ones who entered his office. The two argued that it was he who should give his name first so they could be sure that if anything happened to them, someone would be held accountable. The argument almost turned into a shouting match, but Mendoza eventually stopped asking for their names and sent them out of his office. This entry was posted on July 21, 2008 at 8:13 am and is filed under abduction/enforced disappearances, human rights, State Terrorism, Tagaytay 5. You can follow any responses to this entry through the RSS 2.0 feed. You can leave a response, or trackback from your own site.